America received its report card yesterday, and, for most of us, we deserve to be sent to our rooms without supper. While there were significant gains made over 2011 scores by Washington, DC, Tennessee, and Indiana, the 2013 results reveal that America’s early literacy crisis continues. The 2013 National Assessment of Educational Progress (NAEP) results show that only 1 in 3 fourth grade students (35%) are reading proficiently. While some states and districts have reason to celebrate their significant improvements, as a nation we have a long way to go to ensure that all students have the reading skills they need to succeed in school and in life. Over the past six years, NAEP scores have revealed some progress in reducing achievement gaps between students from low-income families and their better off peers. But a troubling gap remains, and today’s results should serve as a reminder that we need to refocus our efforts to ensure that neither ZIP code, tax bracket, nor skin color prevents students from receiving an excellent education. 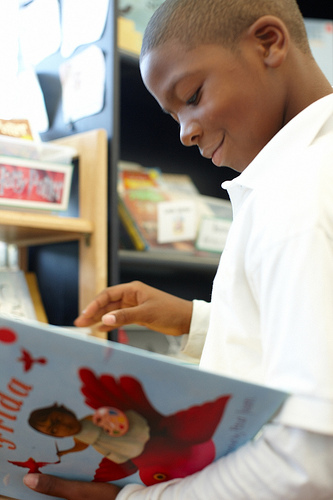 Results from the 2013 assessments reveal a large gap in reading performance between White and African-American students (28 percentage points), as well as between White and Hispanic students (26 percentage points). Gaps based on income level are even more troubling. Just 18 percent of fourth grade students eligible for free meals through the government’s National School Lunch Program (NSLP) were deemed proficient readers, while 51 percent of students not eligible scored proficient. Is Teaching Reading Harder Than Teaching Math? While reading scores stagnated, student achievement in math improved at a significant level over 2011, which raises interesting questions about how we approach these two subjects. ANew York Times article penned earlier this year noted the complexity involved in teaching reading, and highlighted the challenges some schools are facing in helping their students gain strong literacy skills. Educators, policy makers, and concerned citizens across the nation should welcome the news that some states made significant gains. Yet as we attempt to decipher why some states accelerated faster than others, the persistent reading achievement gaps highlighted in the report should galvanize us to all get more involved in helping to solve this problem. Students not reading proficiently by the end of the third grade are four times less likely to graduate on time. More than one million students drop out from high school each year, costing the U.S. an estimated $240 billion dollars in lost earnings, tax revenue, and social services expenses. Ensuring that children master reading in elementary school is critical to our nation’s success, as well as the quality of life our youngest generation can expect.